Sadly, it won't let you swear. We've tried. 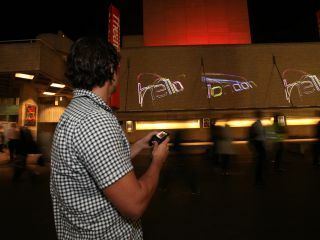 Nokia is using the 'power of the Maemo OS' on the new N900 handset to create a giant interactive installation on Southbank in London. Users will be able to go down to the OneDotZero installation from today until 13 September, and either get their hands on one of the dedicated N900s on offer to write messages, or text them up themselves. However, users of the N900 will be able to control the text from the handset - shake, tilt or manually move it all over the wall. The messages are actually 'ribbons' made up of live streams from Facebook and Twitter, with each mention of the OneDotZero event being used to make up the letters. "I'm very excited to use such an innovative device for our installation" said Karsten Schmidt, co-creator of the interactive installation. "The Nokia N900's newly designed open environment has made it easy to create applications like ours. The variety of natural interactions will truly engage visitors and allow them to manipulate the real-time displayed conversations". And TechRadar spoke to one of the developers behind the installation, who told us that the program used to aggregate the conversations to turn them into lettering will be made open source in the near future, meaning we could see a whole host of innovative controls with the N900.